There's a good chance your smartphone has more processing power than a 1985 Cray-2 Supercomputer. What it doesn't have is a display big enough for a spreadsheet, or a keyboard good for more than cramped fumbling. 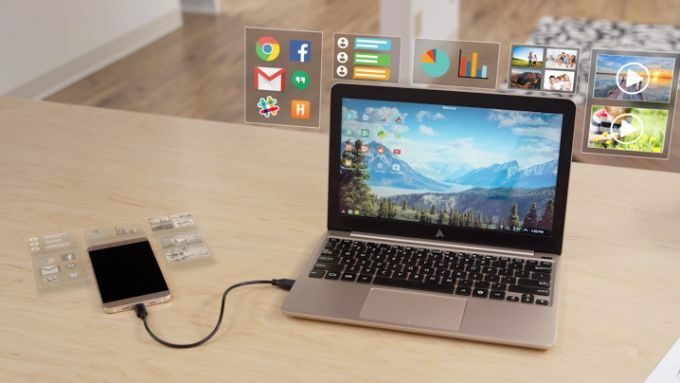 Enter the Superbook, currently available for $99 through a Kicksterter campaign. It looks like a slim laptop, but it doesn't have its own storage or processor. Instead, it gets its power and data connection from your Android phone, via a simple USB cable and a free app. In addition to the keyboard and screen, the Smartbook has a battery, which will last 8 hours and actually charge your phone as you use it. Together, a phone and the Smartbook are plenty for basic word processing, email, and web browsing--all most people really need. There have been a few tries at phone-laptop crossovers, including by major players like Motorola, but none have proven durable. The Smartbook, created by Andromium Inc., seems to have circled back around at the right moment. It has raised over $2.1 million from 12,800 backers so far in its ongoing campaign. That success may be because smartphones are now truly powerful enough to provide a PC-like experience. The Android environment also now provides a nearly complete application ecosystem, with everything from games to accounting apps to CAD software. The Smartbook campaign is even a turnaround for Andromium itself, which tried in early 2015 to fund a similar, but less successful project. The Andromium dock was intended to connect to an external keyboard and monitor, turning a phone into a desktop, rather than a laptop. The more portable form factor, clearly, has a lot more appeal. There is a major common thread between the two projects, though. The Andromium team, which includes alums of Google and Y Combinator, is strongly motivated to help users in developing countries, where smartphones (mostly Android-based) are becoming increasingly common, but both PCs and wi-fi connectivity are still rare. As part of the current campaign, you can donate a Superbook to the Nelson Mandela Long Walk to Freedom Education Project's #Freedom2Learn, which promotes computing accessibility in Africa. At press time, the Superbook Kickstarter campaign has five days left. The Superbook is projected to ship to backers in February of 2017.